The use of Microsoft Office is widely used by Windows users. Microsoft Office is really a cool software that runs on any windows operating system PC. Recently, Microsoft announced the release of Microsoft Office for free on other popular devices, such as the iPhone, iPad and Android tablets. This is an encouraging news, and guess what, you won't be needing your notepad to produce most of your documents. In the past, Microsoft Office was available for the above devices mentioned, but the big deal was that it was on purchase. Finally, Microsoft has placed no charge on the Microsoft Office. As for iPhone and iPad users, am also happy to announce that Microsoft also released three separate office app, which includes the Microsoft Word, Excel and Powerpoint. And these apps are really cool and the most functional apps in Microsoft Office. For the Google Android tablet users, sorry for the shady news, but am also going to inform you guys that the app isn't ready. 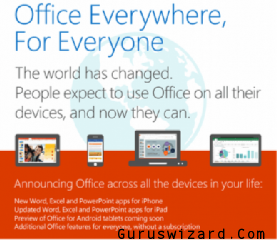 For now, Microsoft announced that the release of the free Microsoft Office for Google Android tablets would be ready in early 2015, and it would be available via Google playstore. Meanwhile, you are expected to sign up for the free preview version of the app and gain free and quick access to Microsoft Office app. Hope the above details was informative. If any of the details wasn't clear to you, please don't hesitate to let us know, and we won't delay to forward feedbacks via the comment section.